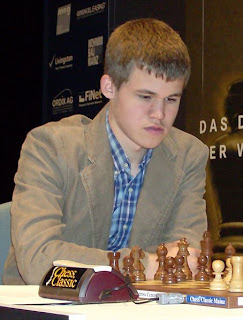 One of the fascinating elements of Carlsen's talent is that he's learned the game by playing computer chess, matching his wits against advanced algorithms. The end result is a prodigy who's amassed an unprecedented amount of deliberate practice at an early age, as he's able to play multiple games on the same machine at the same time. Computers, in other words, have accelerated the pace of his chess education. Lembrei-me deste post lido há tempos no blog de Jonah Lehrer, depois de ter passado o almoço a ler este longo texto de Kasparov (descoberto via o sítio do costume), em que este facto também é referido (Kasparov actualmente treina Carlsen, o mais jovem xadrezista de sempre a chegar a nº1).